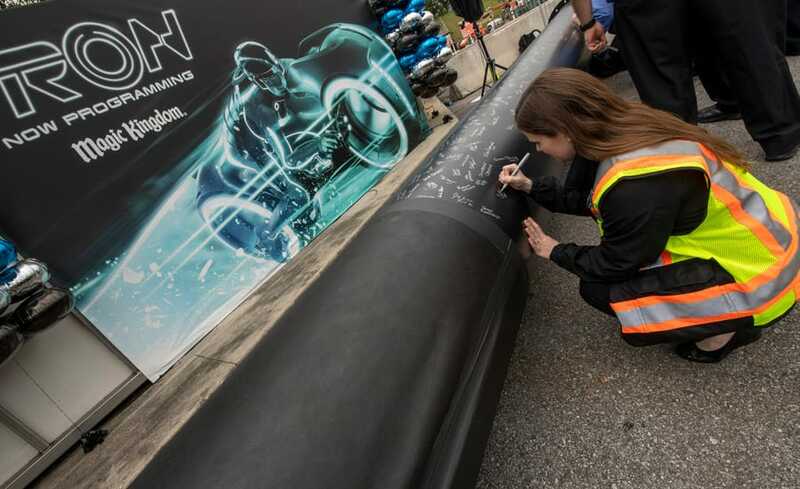 This week, cast members and others working to bring the new TRON attraction to life at Magic Kingdom Park celebrated a major milestone — signing their names on one of the first steel support columns. 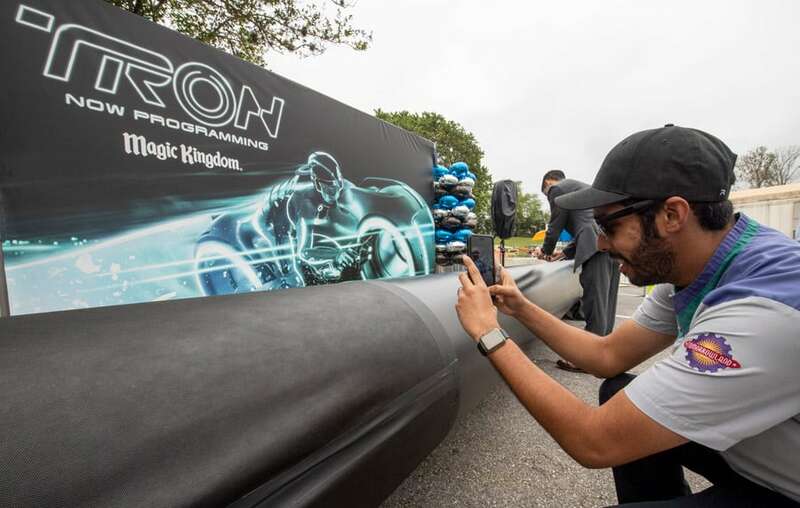 The TRON attraction, which is currently being constructed in Tomorrowland at Magic Kingdom Park, is based on the guest-favorite attraction TRON Lightcycle Power Run at Shanghai Disneyland. 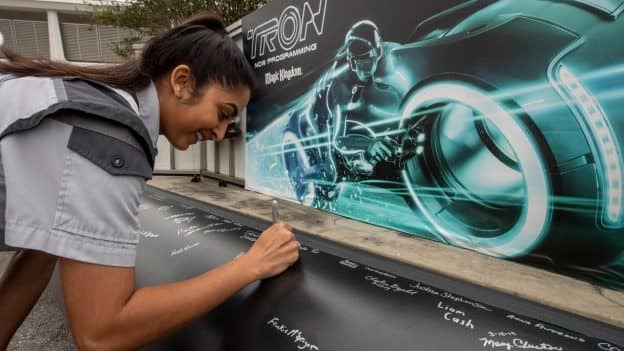 The TRON attraction is set to open at Magic Kingdom Park in time for Walt Disney World’s 50th anniversary. Keep checking the Disney Parks Blog for future updates. Also, our ongoing Wildlife Wednesday series featured a special look at the latest addition to Disney’s Animal Kingdom – Jabari the giraffe calf. Now standing at seven-feet-tall, Jabari has spent the past few months bonding with his mom Mara in a backstage habitat. This week, he returned to the Kilimanjaro Safari savanna to officially join the rest of the giraffe herd. Visit Scott’s original Jabari the Giraffe Calf Joins The Herd story for details and more great images. New Behind-the-Scenes Experience at Rivers of Light Coming to Backstage Magic Tour – There is so much to see and do at Walt Disney World Resort, from exhilarating rides and attractions to spectacular shows and parades and more. But have you ever wondered what goes on behind-the-scenes to bring all that magic to life? VIDEO: Encounter Captain Marvel in Disney California Adventure Park – The one and only Captain Marvel makes a triumphant arrival in Disney California Adventure park! As her jet fighter is being readied for a special mission at Hangar 12 in the northeast corner of Hollywood Land, Captain Marvel lines up a gathering of recruits for a Heroic Encounter and inspires them to go Higher, Further, Faster. 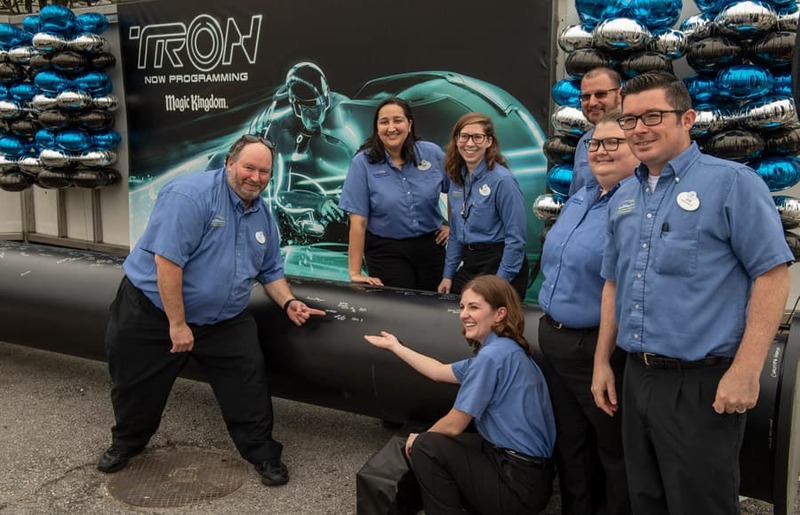 John Ratzenberger Joins the Voice Cast for Lightning McQueen’s Racing Academy – At Lightning McQueen’s Racing Academy, the high-octane show debuting later this month as part of the overall transformation of Disney’s Hollywood Studios, you’ll come face-to-face with racing legend Lightning McQueen and also see and hear from his friends Cruz Ramirez, Tow Mater and more. 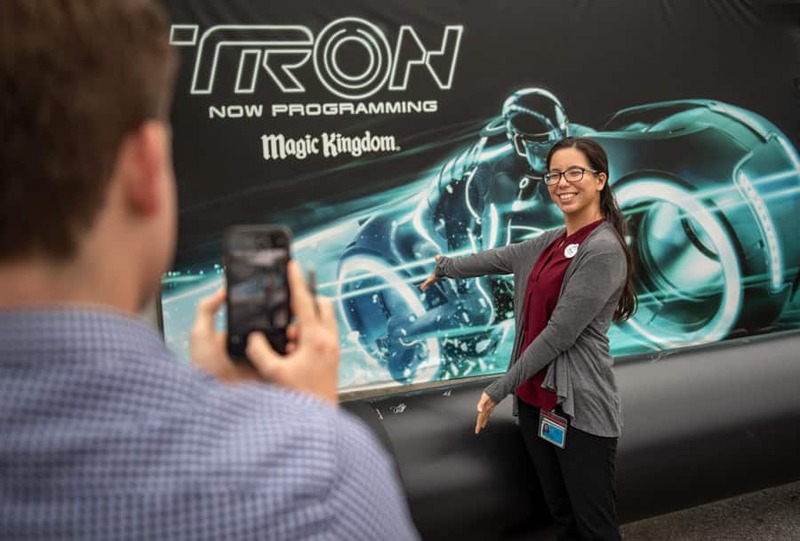 Disney PhotoPass Service Celebrates 100,000 Followers on Instagram – It’s been a little more than a year since Disney PhotoPass Service made its Instagram debut, and we’ve just celebrated 100,000 followers. Yep, that’s right – one hundred thousand! 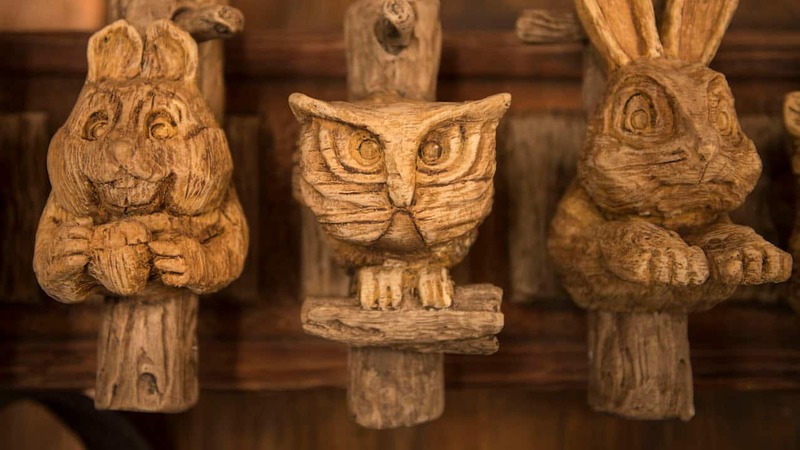 Skillets and Shenanigans – A New Menu Gallops Into Whispering Canyon Café – Howdy folks! If yer lookin’ for some good eatin’ and fine fixin’s, then I’ve got some news for you! Whispering Canyon Café at Disney’s Wilderness Lodge has a rootin’ tootin’ new menu starting TODAY with skillets galore! Special Star Wars: Galaxy’s Edge Panel Unveiled for Star Wars Celebration Chicago – Star Wars fans– Walt Disney Imagineering and members of Lucasfilm will be sharing new details and stories about Star Wars: Galaxy’s Edge during a special panel announced for the upcoming Star Wars Celebration Chicago event. Director Tim Burton Surprises Disneyland Park Guests During a Sneak Peek of ‘Dumbo’ – Over the weekend, Disneyland park guests were in for an awesome surprise when Tim Burton stopped by the Main Street Opera House during a sneak peek of Disney’s all-new grand live-action adventure “Dumbo,” in theaters March 29. First Look at This Year’s Disney Youth Programs Girl Scout Patches In Honor of National Girl Scout Day – Girl Scouts from around the country can embrace the power of fearlessness and courage at both Walt Disney World Resort and Disneyland Resort in celebration of National Girl Scout Day. Would love to be able to visit I’m raising grandkids on a budget so will have to save.